The building is fully let and mostly occupied by BP Plc and McGraw-Hill International who have 243,228 sq ft between them. Other tenants include Foxtons, Porsche, and Sytner Group who are on the ground floor. When BP acquired an additional floor in 2004 they paid a rent of £38 per sq ft; market rents for the building are currently circa £45 per sq ft.
20 Canada Square was sold last month for £410 million to the Cheung Kei Group, which is run by Hong Kong billionaire Chen Hongtian. The deal reflects a net internal yield of 5.35%. Other parties – such as Sidra Capital ¬– also bid, but their offers were significantly short of the winning amount. 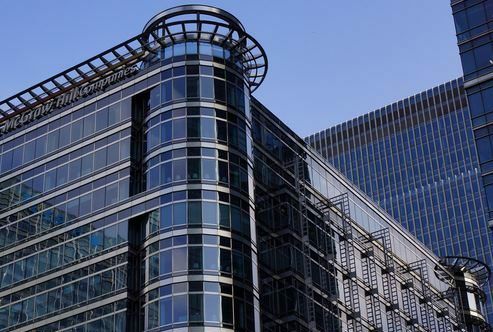 Eugene O’Sullivan, Surveyor and Director at Morgan Pryce, says; “5.35% is a strong yield for London offices, although 20 Canada Square is not central, and in a downturn the large floor plates could prove difficult to let. Let’s hope BP and McGraw-Hill International don’t need less space in the coming years”.